Arvind Rao is an Associate Professor in the Department of Computational Medicine and Bioinformatics, and Radiation Oncology in the School of Medicine. 1. Transcriptional Genomics: A bioinformatics framework that identifies tissue‐specific enhancers by integrating multi‐modal genomic data has been developed previously [Rao2010]. There is interest to integrate other sources of information (like epigenomic and ChIP datasets) to improve the efficacy of enhancer prediction. We have also participated in the TCGA Glioma groups’ work [Brat2015, Ceccarelli2016] on identifying transcriptional regulators underlying gliomagenesis. 2. 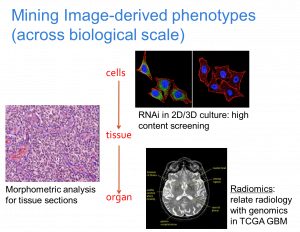 Image Informatics: In order to quantify the phenotypic aspects of disease and their relationships with outcome and their genetic context, we have developed methods for the analysis of histopathology [ Mousavi2015, Vu2016] and radiology [Yang2015] images, focusing on tumor heterogeneity. One direction of our group is to develop image analysis tools to delineate tumor image features from radiology data and to develop predictive models to relate them along with underlying genomic measurements to outcomes in low grade gliomas. Further, we have also investigated methodologies to link tumor imaging, genetics and immune status in gliomas. More recently, my group has been studying the relationship between image-derived features, genetics and cognitive status in glioblastoma patients. Further, we have also developed methods for the analysis of multiparametric MR datasets in Radiation Oncology. 3. Heterogeneous Data Integration: Integrative decision making in the clinical domain involves the need for principled formalisms that can integrate pathology, imaging and genomic data sets to drive hypothesis generation and clinical action. We have focused on developing high throughput measurement pipelines from this diverse array of data sources and methods for their integration. Simultaneously, methods for visualization are also under investigation. A more recent interest of our group is to integrate genomics, imaging and (online) behavioral data from patient to assess their evolving response to treatment, in the context of learning healthcare platforms. This could also enable the development of hybrid diagnostics. 4. Informatics for Combinatorial Drug Screens: the availability of multimodal data sources (cell line genomics, drug assays) coupled with high throughput, high content imaging platforms have created the need for informatics frameworks to identify rational drug combinations capable of modulating disease-associated phenotype. In this context, we have worked with the Gulf Coast Consortium to create analysis platforms that jointly mine imaging and genomics data for combinatorial drug discovery. The overall goal is to link different data sources, such as imaging-derived phenotypes with genomic alteration for clinical predictive models. This has prompted work in AI/ML models for image processing &computer vision, data integration and genomic analysis.